The Marriott so wants to be able to overcharge you for Internet that they want the right to block your own wifi. After being fined over half a million dollars in 2014, Marriott International and the American Hotel and Lodging Association came back in December of 2015 and asked FCC to give hotels the green light to remotely disable your Wi-Fi hot spots. This would gift them local wifi monopolies so they could go right back to overcharging consumers. When I wrote this post, I did not expect there would be an update to the story. But here we are. More here and here. In their formal petition, the hotel industry asked the FCC to create an exception to rules that prohibit anyone from “willful or malicious interference” with wireless communications that are “licensed or authorized” by the government. Their argument is that Wi-Fi signals use unlicensed frequencies, they do not deserve the same protection as licensed services like cellphone networks. That is an absurd argument, since the government has authorized unlicensed Wi-Fi devices and networks. More here. The response from the public, and the FCC was somewhere between outrage and genuine surprise CNN called it a "firestorm". Both Google and Microsoft opposed the request Google wrote simply “Allowing hotels or other property owners deliberately to block third parties’ access to Wi-Fi signals would undermine the public interest benefits of unlicensed use...” Marriott retracted its request by January 13th. "The Communications Act prohibits anyone from... interfering with authorized radio communications, including Wi-Fi... Marriott's request seeking the FCC's blessing to block guests' use of non-Marriott networks is contrary to this basic principle." 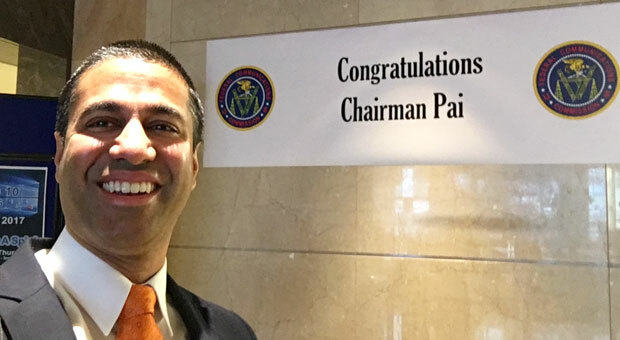 I update and rehash this story now, two years later, because we have a new FCC commissioner, Ajit Pai. Pai is an industry lapdog compared to Wheeler. In a similarly callous and obvious industry over-reach, a group of telecom companies, including Comcast, Verizon, AT&T and T-Mobile, filed a petition asking the FCC to click undo on the existence of of Internet privacy rules. Pai's response was "Yes master." His opinion on net neutrality was even worse promising to take a "weed wacker" to it. More here and here. Were he the commissioner back in 2014 I expect my hot spot wouldn't work at the Marriott.